The Wabbit, Lovely Lapinette and their diplomatic guests gathered to have a post adventure drink in a nearby cafe. "Did I hear mention of carrot aperitivi?" said the Wabbit. The aperitivi duly appeared on the table and everyone chatted enthusiastically. 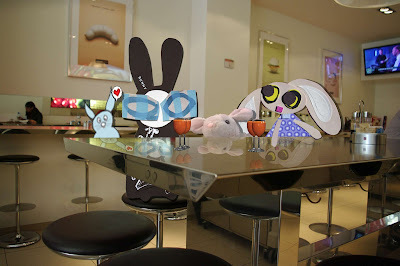 "There was something I wanted to ask," said the Wabbit. "Can you tell me what your top level talks were about?" "Oh," said Pink Bunny, "that is most hush-hush." "Das ist verboten," said Rettet Kaninchen. Lapinette looked at the Wabbit. "I suppose anything that’s not forbidden is allowed!" she laughed. Pink Bunny laughed too. "In that case, we can tell you that the Agents of Rabit have been setting up puppet governments and our job is to stop them," she said. "Puppet Governments," mused the Wabbit and he imagined a parliament full of Pinocchios. "I can see what you’re thinking," said Lapinette. "No you can’t," smiled the Wabbit and he changed his thoughts to a parliament crammed with Punch and Judy characters. But just as they were hitting each other with police truncheons, Lapinette broke in. "Punch is funny," she said. "How did you know I was thinking of Punch and Judy?" asked the Wabbit. "Lucky guess?" said Lapinette sweetly. "Puppets can be nice, like Kasper in Hohensteiner Puppenspiele!" said Rettet Kaninchen. "When Good Puppets go Bad," sighed the Wabbit.